Let’s talk about another one of the animalistic perfume ingredients. Civet. Just like musk its value for the perfume industry lies in its ability to enhance fragrances and prolong the life of scents. So now to the less romantic part. 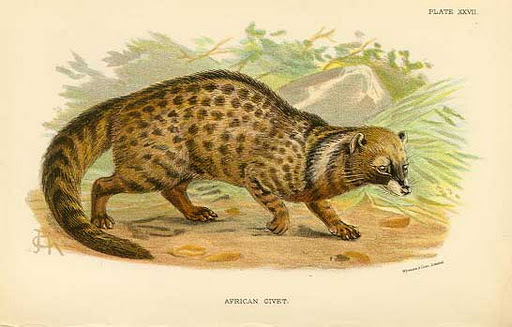 Civet, or civetone as it is called at its more refined stage, is a substance taken from an animal called the African Civet – a nocturnal animal in sub-Saharan Africa. It eats most things, including snake and species that other animals find too poisonous to have for dinner. When moving around a territory the civet spreads a fluid to mark it. This fluid comes from the animal’s perineal glands and is the link between this African mammal and the perfume industry. There is definitely a market for civet, which has led to numerous civet farms where animals are kept under dubious conditions only to serve as sources of gland secretion. One animal provides the owner with three to four grams per week. Civet is one of the absolutely oldest perfume ingredients, particularly popular in France. It has a strong odor similar to musk and is used in very small quantities as a fixative that gives the fragrance depth and longer life. Chandler Burr compares it to using whole cream in soups and sauces.